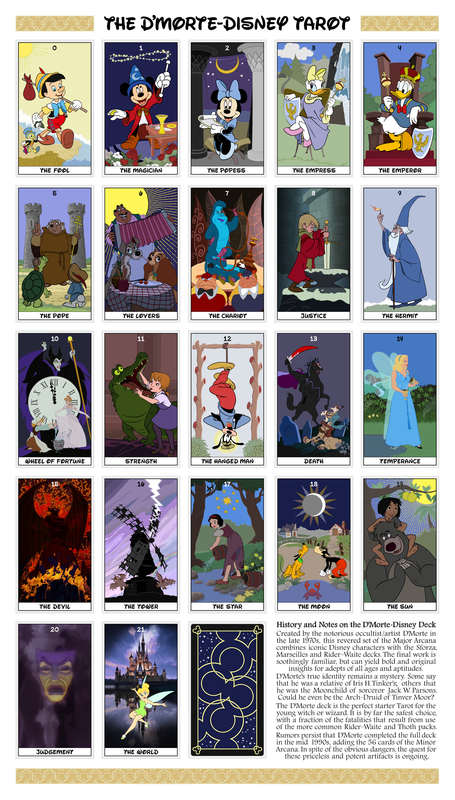 Posted on April 29, 2014 April 29, 2014 by dmorteoccult	This entry was tagged disney, dmorte, major arcana, occult, tarot. Bookmark the permalink. Link to card 12 is wrong. Links fixed …. thanks for the alert! Glad you like them. Yes, unlikely that Disney would ever approve. The deck has to exist as an art piece, non-commerical. Fantastic – I’d be delighted! Only one request: if you could take a photo of the cards when you have them printed and email it to me? I can post it on the forum; I’d love to see what they look like as physical objects, as I want to do that myself, once I get the minors done. I’ll keep you anonymous of course, just show the cards themselves, or held in hands. That way there’s zero danger of Disney nastygrams (I don’t think they care, but I tend towards extreme caution). Let me know if the images online print out OK; I have higher res versions, but I think the ones online should print well on the smaller card format.